"The Ark. Old Seeds for New Cultures"
Construction and Sowing introduce a double dimension to architecture, as the organisation of what has been built, but also of open-air spaces and the ground. With this proposal we want to bring the sites of culture back to contemporary architectural practices taking the word culture in both its versions, that of civilisation and that of agriculture. "People meet in culture". Seeds constitute the organic departure point of landscape, the morphogenetic software of its architecture, the core of a process of continuous transformation. In Greece, the economic and social crisis of agricultural land is connected not only to the explosion and diffusion of the metropolis, but also to the extended degradation of the landscape. Intensive agriculture with specialised single-crop farming, fertilizers and pesticides has limited the practices which above all, offered variety to a natural landscape. On the other hand, the predominance of a universal monopoly in the circulation of seeds controls and impoverishes the diet of the urban crowd, in view of the universal food crisis. This impoverishment is synonymous to the impoverishment of memory and history which in the case of Greece is rich in variety and in depth of time. Ultimately, the morphologic denudation of the lowland from elements of its environmental and cultural memory conforms to the even more unfavourable and irreversible overpumping and degradation of the subsoil. The purpose of the proposal for the Greek participation in the 2010 Venice Biennale is the presentation of the phytogenetic variety of the Greek landscape which is in extinction and the presentation of the local cultures which correspond to the variety of the Greek local reserve. A variety which can be "resowed" in the terms of today's prevalent urban pattern. DESCRIPTION AND FUNCTION OF GREEK PAVILION. 1. The Ark, a wood installation containing (a). A collection of seeds and plants, (b). A video projection of people in agricultural activities (c). A kitchen. The Ark: We introduce the idea of a travelling inventory of seeds and genetic plant material which will be collected through networks. This travelling inventory of seeds is put forward as an exemplary instrument of knowledge and information, also capable of being part of versatile models of metropolitan cultures, both inside the cities and on the outskirts. A travelling depository of Greek genetic plant material called "the Ark" is constructed. This Ark has its own architecture with a programme that offers the possibility of filing and saving, as well as of transportation, display and cooking. It is a wooden construction (12 m length X 2,70 m. max width X 3,30 m. height). The wooden manufacture is constituted by wooden beams, metal joints and plywood surfaces. It is a moving construction that can be set up firstly in the Greek pavilion and then re-established wherever possible. In its interior the biogenetic plant material (seeds, dried fruits, wreaths, plants) is exposed in special glass vases, dishes, metal buckets etc. This material will be collected after research by visits in farm units and banks of seeds. The collection will be placed in the ark in thematic units: Alimentary (cereals, legumes etc) Therapeutic, Αphrodisiac, Decorative, Εuphoric, Mortal. Τhe research, selection and collection of seeds and plants for the ark will be done by the biologist Orestes Davias. 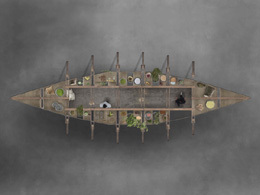 In the interior space of the ark, the installation of plants and seeds is supplemented by the installation of a small kitchen. Food preparation from the ark's collection material allows the visitor along with the cook to inhabitate the Ark's pavilion space with a potentially interactive way. A video-documentary is projected in a monitor inside the Ark. It is a documentation of the modern rural life in Greece and the alternative cultures that make a contribution to the increase of biodiversity and to the conservation of traditional genetic plant material. The production of document requires shootings in the countryside, archival research, and studio work (montage etc). Video Direction: Yannis Isidorou, artist. Zissis Kotionis is a PhD architect practicing in Greece. He is a Professor, Chairman of the Department of Architecture and Dean of the School of Engineering, University of Thessaly. He has published five books in Greek on architectural theory and urban studies: "The Question of Origin in the Work of D. Pikionis"(1998), "44 Stories of Architecture"(2001), "The Folly of Topos. Architecture in the Greek Landscape" (2004), "Where, is Athens" (2006), "Morphopoetics. Action in the Landscape" (2007). Projects and buildings of his architectural studio have been published and awarded in Greece and abroad. He is also involved in artistic performances and installations and in public art practices (group Urban Void). Selected exhibitions: Biennale of Venice (architecture) 2004, 2006, Biennale Sao Paolo (Urban Void, 2007), Biennale of Architecture, Krakow (1989), Mediterranean Biennale for young artists (Barcelona, 1989), Europan, Madrid (1993), Athens Biennale of Architecture (1995, 2002, 2006). We have not announced the exhibitors and details of our project. We will do it within a month.